(Evansville, IN) June 1, 2016 -- SIGMA Equipment announced today the launch of its new mobile app, available for Android™ devices. The SIGMA Equipment app allows users to create and upload equipment listings from a phone or tablet. The app is named, simply, SIGMA Equipment. By giving customers a better way to create listings when using a mobile device, SIGMA hopes to increase the selection of equipment it offers. Each listing is reviewed by an Acquisition Specialist, who helps the customer refine the information that will help the equipment sell quickly. 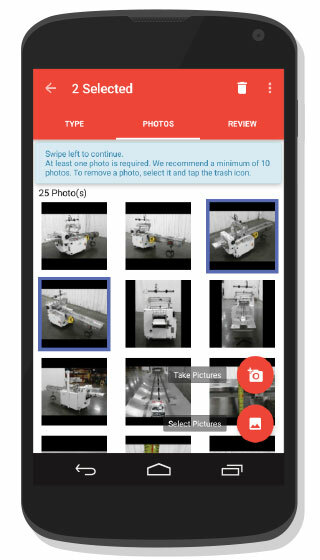 SIGMA Equipment includes several app features to help customers optimize a listing, such as helping the customer identify the manufacturer, and requiring at least one photo for each listing. SIGMA recommends that each listing submitted through the app should have at least 10 photos. The app is able to access existing photos from the device’s camera roll, or open the camera to take new photos. An internet connection is required to download the app, as well as to upload the finished listings to the SIGMA website, but a listing can be created and saved to the phone without internet access. Unlike similar apps that require each listing to be uploaded as it is created, SIGMA Equipment lets users save listings on the mobile device to upload them at a later time. The app, SIGMA Equipment, is free on Google Play™.